Conservative MP Nick Herbert has opposed the idea of his party forming any alliance with UKIP, arguing it would result in a "damaging trade-off" against his party's appeal to the centre ground. 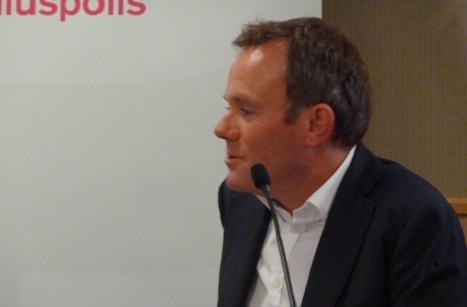 Herbert was speaking at a Conservative Party Conference fringe event hosted by think tank Policy Exchange and featuring voter research presented by Populus’ political director Rick Nye. The idea of local alliances between UKIP and the Tories in the 2015 general election had been put forward by UKIP leader Nigel Farage in a Times article earlier today. However, Herbert said that the Populus research suggested the Tories could be turning their backs on a much larger group of people than UKIP supporters. The research divided voters into six categories of attitude including "comfortable nostalgia" (9 per cent), "optimistic contentment" (19 per cent), "calm persistence" (31 per cent), "hard-pressed anxiety" (13 per cent), "long-term despair" (19 per cent) and "cosmopolitan critics" (9 per cent). According to Populus, the biggest category of "calm persistence" was the most contested between the three main parties, while UKIP’s strongest showing came in the "comfortable nostalgia" and "long-term despair" categories. Herbert said the research was "an important reminder of the importance of coalition [of the different wings] within our party" and claimed that an alliance with UKIP "risks repelling a much wider group of people whose views about UKIP we don’t properly understand ourselves". He continued: "If we are to increase our share of the vote it will not be by striking a small alliance with the right… but by extending our appeal into the North and with ethnic minorities and women."